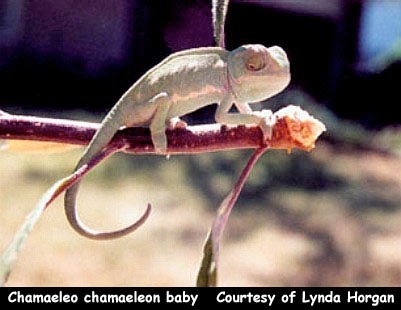 Note from the CHAMELEONS staff: We wanted to print an article dealing with care of newly hacthed or born chameleons. We are glad that Lynda Horgan agreed to submit her care regimen. She is a successful chameleon breeder, but what is more interesting is that she breeds chameleons in Canada. Most chameleons never see snow and successfully raising them up in the higher latitudes takes some attention to detail! While some of us are lucky enough to live in areas where we may put babies outside and they pretty much take care of themselves we decided to pursue an article from someone who has to work at each and every step to ensure success! Well, again there are veiled chameleon eggs in my incubator that are going to hatch in the middle of winter. Because I live in Canada, raising hatchlings in the winter here presents quite a few different problems and possibilities that I would not likely have to deal with if I lived in a warmer area. One of the most obvious problems is that the hatchlings can't go outside to get some sun - in fact, in all likelihood, they won't be able to go outside here until several months after they have hatched. This leaves them stuck with getting their UV rays only from a florescent UV bulb. I use quite a few different bulbs depending on what is available, but at the moment I am using the ReptiSun 2.0. In my opinion, changing the type of bulb used can require a change in supplementation (dusting...not gutloading). I keep the babies in glass tanks with screen lids in order to keep the hatchlings warm enough and somewhat humid. Plants in the cages help, to some extent, with the humidity, as do several mistings a day. There is little problem with standing water since water from the misting evaporates quite rapidly due to the constant dryness of the room's air. In addition to the above problems, raising hatchlings here could be subject to other events that would not have to be faced if I lived in a warmer area. If it snows a lot or we get freezing rain, there could be a problem getting to the pet store to get a supply of small crickets. Often pinhead crickets are the only food readily available in the winter. There have been times when the snow was so bad that no traffic was able to move for a day or two. Fruit fly cultures are not available at any of the stores near us and I haven't been able to raise my own. So to insure that we have pinhead crickets available in case we can't get to the pet store to buy them when we normally would, we buy extras each week. If all is well with the weather, we simply care for these extra crickets and feed them to bigger chameleons when they grow large enough. Another worry is the possibility of a power failure. In the area where I live, a power failure often accompanies a heavy snowfall or freezing rain... but luckily the power outages haven't lasted long. I have a wood burning fireplace and can move the chameleons into the room where its located if need be.... and I always keep a supply of those heat packs (that skiers use to keep their hands warm) on hand. Luckily I haven't had to use these heat packs for a power failure yet...but if I did they would be sandwiched between the cages to help keep the chameleons warm enough to survive. I never place heat like this beneath the cages in case it could burn the foot of any chameleon that walked across it. A towel/cover can be placed over most of the top of the cages to keep the heat in while these heat packs are being used. Because the hatchlings are kept inside, there are differences in their supplementation too. In spite of gutloading the pinhead crickets and the exposure of the hatchlings to UV lighting, I have found it necessary to still lightly dust the crickets with calcium two or three times a week and lightly with vitamin D3 once a week. Now that I have dealt with all the possible problems that I can think of that I could face when raising hatchlings in a northern climate like this, I'll move on to their care. In order to keep this as uncomplicated as possible the following method is what I use for raising veiled and panther hatchlings because other species will need to be done differently with regards to humidity, heat levels and supplementation. The hatchlings are fed pinhead crickets at least once a day everyday.... and oftentimes more than once a day. I feed them as much as they can eat for the first few weeks of life. I don't bowl feed them but simply free-range the crickets trying to make sure that there are none (or at least very few) left in the cage at night. The hatchlings usually clean up every cricket available with no problem! As I mentioned above, I keep the hatchlings in glass tanks. Anyone from a warmer, more humid climate would use a screen cage. The aquariums are long low glass tanks (24" x 12" X 12") not the deep kind, so that the chameleons will be closer to their food and thus won't use a lot of energy chasing the food down. The use of this type of tank has the additional benefit of ensuring that the hatchlings are close enough to the UVB lights at all times. These lights are left on for about 12 hours a day. I usually use two florescent bulbs over the top of the cages since the fixture holds two. The bulbs are about 2 or 3 inches above the cage top. The cages are kept on plant stands that are the four-foot long three-tiered kind that people use to start seedlings on. The trays have been replaced with wooden shelves. 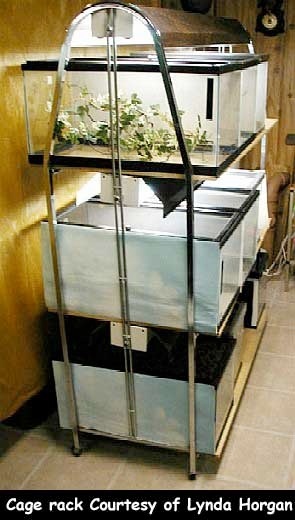 These shelves can be slid forward or back to some extent to alter the temperature in the cages slightly. The light fixtures on the plant stands not only hold the two fluorescent but also have a spot for two incandescent lights on each level that may be used if extra heat is needed. I don't usually have to use them. Since the hatchlings have small bodies, they can dehydrate, overheat and cool off much quicker than adults can, its necessary to keep the temperatures more moderate. 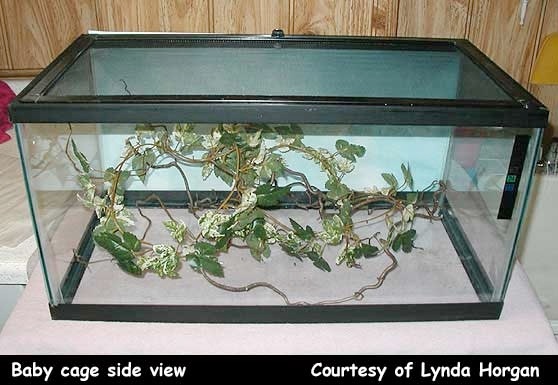 This long low tank (in which I have placed many thin branches and either well washed real or artificial plants) also gives them more horizontal space so that they may spread out. I have found that this seems to make them more comfortable than more vertical space does. They seem to "argue" less this way. I usually put 6 or 8 babies in each tank to start off with, and as they grow they are split up more and more. If there are any that seem to be too stressed out or not growing as quickly as the others, then they are separated out as I notice them. Feces are removed frequently from the cages...not daily until they are a couple of weeks old, but every two or three days. I don't like to disturb the newly hatched any more than necessary until they have had a chance to get used to me. 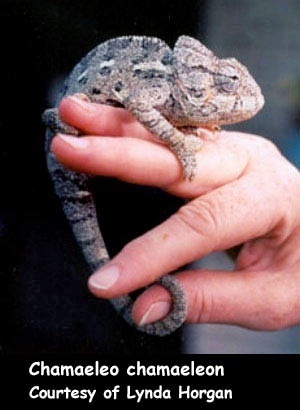 To remove the feces, I simply lift the branches (chameleons and all) out of the cage and hold them in one hand while I clean the bottom of the cage using the other hand. 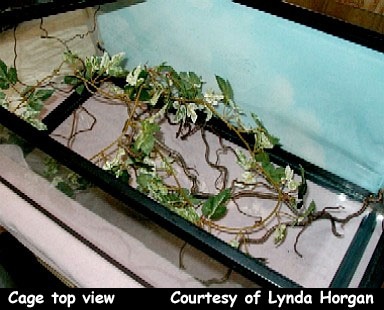 The branches are held over a table so that if any of the hatchlings fall off in their sometimes ensuing panic, they don't fall to the floor. I don't use any substrate in the cages so that none can be accidentally ingested possibly causing an impaction. If real plants are used, I cover the soil with little stones that are too big to ingest so that the hatchlings won't ingest any of it. As I mentioned before, I mist the tanks several times a day. I don't use drippers on the hatchlings' cages because the drips are rather large for a little chameleon to try to drink from. Too much water might flow into its mouth at one time and be aspirated if a hatchling tries to drink from a big drop. Puddles formed on the floor of the cage when using drippers present the same danger to the hatchlings. I make sure that the mistings consist of a fine spray so that no large drops of water or puddles occur. This minimizes the risk of any of the hatchlings taking in a big drop of water that they might not be able to handle. The above method is not the only method for rearing hatchlings in a cold climate, but it has worked very successfully for me! As you can see from the above information, it can be a worry having the eggs hatch in the winter weather in a cold climate. With a little luck and a certain amount of planning, it can still be done quite successfully though. I hope that this article has given the readers at least food for thought about the differences in rearing chameleons in different areas of the world! 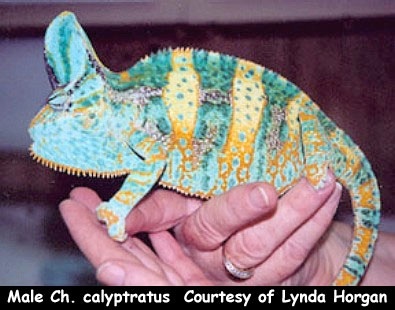 Lynda Horgan lives in Ontario, Canada and has been keeping chameleons for about 15 years now. She has bred them since 1994 with Chamaeleo chamaeleon being the first kind that she hatched. She keeps a number of other lizards and turtles too but, in spite of them being one of the most difficult species to keep, the chameleons are her favorites.